Booking now open for “The 39 Steps”! Booking is now open for the fantastic spy comedy “The 39 Steps”! This “Hitchcock meets Hilarious” production will have audiences of all ages rolling in the aisles. The Oakwood Arms has been transformed into a 1930’s style theatre and this week the final touches are being put on the lighting and sound plots for a highly involved and breathtaking production. Get the Christmas season started early with a family trip the “The 39 Steps”, or even call into Pier 39 for a pre theatre early bird menu. Interval drinks can also be ordered in advance to add to the event! Tickets are €10 and are available on 087 155 3055. The show runs from Monday Dec 3rd to Friday Dec 7th. The 39 Steps are nearly here! Only a couple of weeks left to “The 39 Steps”! Rehearsals have been frantic for the last two months, and Tony and Ian have been working hard on all the sound cues. Paddy, Frank and the stage crew are performing miracles to transform the Oakwood Arms function room into a 1930’s Theatre. Diarmaid has his lighting rig coming in a week early to give us a full week of Tech rehearsals. Anne and Nicky have pulled together all manner of wierd and wonderful props and costumes for this truly exceptional piece of theatre. Tell your friends, bring your kids, just don’t miss it. There are early bird menus available in Pier 39 so why not make a night of it. Those of you who have taken the seasonal November “pledge” can look forward to bar service for your interval drinks as you kick off the Christmas season! Booking opens next Monday on 087 155 3055. Its been a while hasn’t it? We’re still trying to get the footage of “Run for your Wife” into usable shape for a Video night, but unfortunately our video guy got a job in Cork and doesn’t have much free time to work on it! 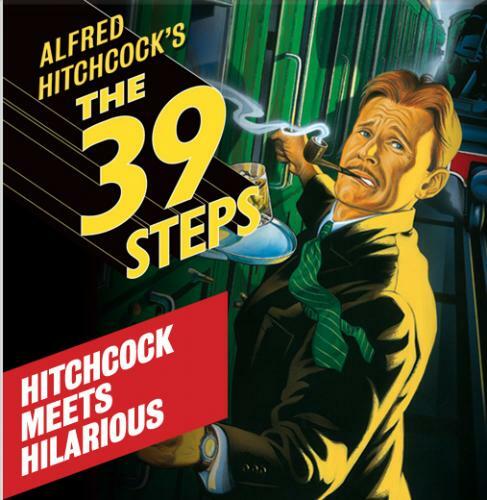 Anyway, we are proud to announce that our next Full length play will almost certainly be the parody of Alfred Hitchcocks “The 39 Steps” fresh from London’s West End. This is a clever parody with multiple characters played by a small cast, clever use of lighting, sound effects and props all combined to bring a classic spy story to the stage including Nazi spies, Biplane Battles, Train Escapes and even the Forth Bridge! This production is still running in London, but Restricted rights are available until the end of the year before they are being withdrawn again. We plan to put this on the 3rd week of November 1st Week of December for 5 nights. The cast as written calls for 3 Men and 1 Woman to play all the roles, but there are options to split this out further if necessary. Ted will be directing and it will be his call on how he wants to handle that. In other news, we are inviting our friends from Choke Comedy back in October to present a new short comedy play by Ann Blake and Marie Boylan called “Tan”, about two Limerick girls getting ready for a night out on the town. We will be presenting two Geraldine Aaron One Act plays to support this, with Eoghan Rice and Lauren Dunne in “Bar and Ger” and also Edel McFadden and Noel McNamara in “The Galway Girl”. This may be a slightly different interpretation depending on how it works out in rehearsal!